This queen sized quilt is one that I made out from someone else’s UFO. One day last fall, I received an email offering a partially made quilt top and coordinating fabric. An unknown quilter had gifted it to Judy, who was moving to a new home and purging her sewing area. Judy needed to pass this along. This was the photo. The photo intrigued me. Confident that I could finish assembling the quilt, put on some borders and then quilt it, I gladly accepted the UFO. I like a challenge. However, when it arrived, I saw it in a different light. The photo does not show the intensity of the chrome yellow fabric. When I put it up on my design wall to consider how I would finish it, I found the yellow and red fought for dominance in the quilt. Every time I walked by, I shuddered. It bothered me so much that I ended up taking it all apart. I used the extra fabric to make more red and white singleton blocks with a polka dot center. I made a few half snowball blocks to extend the points out into the negative space beyond the center. Then I added a red check inner border and a red polka dot outer border to finish the top. Before I quilted it, I noticed a dirt smudge on one of the snowball blocks. I decided to spot wash it before I quilted it. It came clean and I hung it to dry. The next day when I mounted it on the longarm, I noticed that the colour from the red check fabric had bled into the white fabric. After a quick internet search on what to do when excess dye runs, I ran to the grocery store to buy Dawn detergent. I filled the bathtub with lukewarm water, added half a cup of Dawn and then laid out the top to soak in the soapy mixture for three hours. I was a tad stressed as I saw the water turn a lovely shade of pink. Apparently, there is something about the Dawn detergent that makes the colour suspend in the water and not in the fabric. I followed the recommendations for draining and rinsing. It came out perfectly with no bleeding visible. Just to be on the safe side, I repeated the whole procedure, but I did not need to do so. No more dye came out. I’m glad to know this trick. It will come in handy again, I am sure! With that ordeal over, I quilted it with a lush feather edge to edge design that sets it off nicely. The binding is a tonal red fabric that visually contains those polka dots! I’m pleased with the final outcome of this quilt. This quilt won Grand Champion, Machine Quilting at the 2016 Wellesley Fall Fair. It now goes into my stash of wedding gift quilts for some future bride and groom to select. I have a plan underway for what to do with the leftover yellow and red nine patch blocks. It involves a bottle of brown dye! I am certain that most people with not recognize them as having been part of the original UFO. This queen sized quilt was made as a wedding gift for my close friend Pat and her husband Alan. These colours are Pat’s favourites and they suit her neutrally decorated house. It took me a while to collect the fabrics and I enjoyed every minute of it! Some of the fabrics came from my stash while most were acquisitions on two memorable shopping trips. The quilt design is called Winding Ways, a traditional block that when set together creates a secondary circular design. It took quite a while to piece this quilt, but since I was not in a hurry, I was able to enjoy the process. I assembled most of the top during the summer at our cottage where my design wall is a hardwood floor adjacent to the main traffic area. Everyone who passed by offered comments and opinions on where I should move blocks for best effect. I feel like it was a group project! The quilting design is a series of overlapping circles to echo the secondary circular design and give movement to the quilt. Pat really likes the quilt and sent me this photo showing the quilt on her bed. Looks great, doesn’t it? This queen sized quilt was inspired by some vintage Dresden Fan blades I found in my UFO cupboard. I wanted to make them modern, so this is the result. The pale peach background fabric is a wide fabric that I bought in the night market in Cairo, Egypt. I have great memories of that shopping trip when a friend and her doctor-fiance negotiated for me in Arabic. He advised me to stay silent because as a man, he could get a much better price from the male vendors. He did get an awesome bargain for me! The Dresden Fans are appliqued onto the background in a non-traditional asymmetrical arrangement that gives the quilt a fresh, modern appeal. The broken inner border is also a modern element. The quilting design is an edge to edge digital pattern called Dresden Fan by Kim Diamond of Sweet Dreams Quilt Studio. It is stitched in a peach thread that matches the background and backing. The same fabric French fold binding is applied to the front and hand stitched to the back. Modern Dresden won first place in its category, Grand Champion Machine Quilting and Judges Choice at the Caledon Fair as well as Grand Champion Machine Quilting at the Fergus Fair. I love pretty ribbons! This quilt was made from a traditional pattern called Double Chain, which was printed in 1881 in Godey’s Ladies Book. It is fairly simple to piece, once you figure out the best way to lay your patches to avoid piecing confusion. It uses the partial piecing technique, which is fairly simple in this case. This made a nice dent in my stash of light and dark blue scraps! The quilting design is called Along the Way, by Anne Bright. 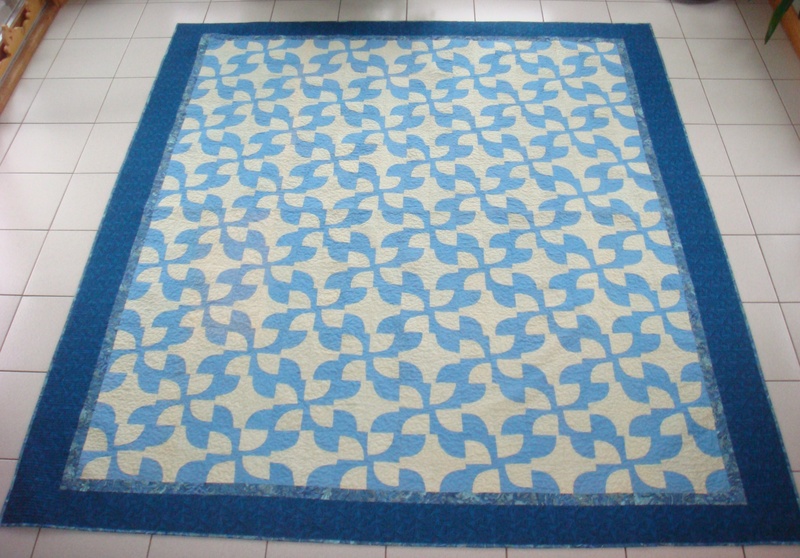 It was done in a dark turquoise thread which gave nice definition and texture to the quilt. This quilt won Grand Champion, Machine Quilting at the 2014 Caledon Fair and the 2015 Drayton Fair. It won second place at the District 7 competition in 2015. It now goes to Michael and Rory for their wedding quilt. There was a time when I was worried I might not have enough quilt tops ready for gift giving, so I made a foray into eBay to buy some flimsies. Long story short, the tops did not turn out to be exactly what I expected. Embarrassed by my less-than-prudent purchases, I stuffed them into my flimsie cupboard to hide their shameful existence. To ensure I am never again tempted to purchase tops without seeing, touching, verifying quality of fabric and construction techniques, I am firmly encouraging myself to quilt all of the tops. In the process of fixing and finishing, I have discovered a silver lining to this experience. I have learned a great deal about turning challenged flimsies into presentable tops. I know much more about straightening borders, quilting in extra fullness, and keeping tops square and flat. Quilt Rescue skills, I call them! This Drunkard’s Path was one of the dozen or so tops I purchased. It was the best top of the entire lot. The hand-stitched top was quite old, but the fabric was in very good shape and the seams were finely stitched. This top required some repair to several seams and four of the blocks were assembled incorrectly, making the pattern a bit off. I removed the wonky blocks, reassembled them correctly and then put them back into the top. I also had to make some seam adjustments on the sides, nipping in the seams till opposite sides measured the same length. Once straight and square, I added the printed inner border and the wider tone on tone outer border to finish it off. The center of the quilt did not lie completely flat, so I quilted it with a dense meander that helped to draw in the excess. The low-loft cotton batting has a bit of an old-fashioned look to the finished quilt. The borders are quilted with very narrow horizontal lines, resulting in a densely quilted firm border. I used a mushroom colored thread in the center, which seemed to blend with both the dark and lights and a dark teal thread in the borders and a Bottom Line thread in the bobbin. The binding, which matches the inner border, is applied to the back and top stitched to the front. Finished size is 84″ by 98″. I’m quite pleased with the resulting quilt. It turned out significantly better than I anticipated. In fact, I can stop feeling embarrassed and be proud of how I rescued this top from oblivion. Goal Status: 46 quilt projects complete and 6 more to go to get to my goal of 52 completed projects by December 31st. Two weeks to go! Can I accomplish what I set out to do? The next week will be quite busy, but I am still feeling I will manage to complete my goal. Keep your fingers crossed for me!